Laura Huxley’s candid recollections offer a compelling glimpse into her life with one of the greatest writers and visionaries of the 20th century. She was a teenage violin virtuoso who met Aldous soon after leaving the concert stage for Hollywood. His 1932 novel Brave New World established him as an undisputed literary giant. They married in 1956. Sharing an interest in the evolution of human consciousness, the Huxleys pioneered the use of LSD. Their lives and work impacted generations and gave shape to an important chapter of American cultural history. 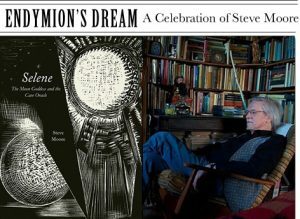 The film is narrated by Peter Coyote and includes interviews with Laura Huxley, drummer John Densmore (whose band, the Doors, was named after Huxley’s book The Doors of Perception), spiritual leader Ram Dass, Esalen co- founder Michael Murphy, artist Don Bachardy, philosopher Huston Smith and actor Nick Nolte, star of the adaptation of Huxley’s novel The Genius and The Goddess. Huxley on Huxley is an intimate portrait of a compelling personal and professional union. Birkbeck Cinema, 43 Gordon Square, Birkbeck University of London, WC1H 0PD. A Celebration of Steve Moore with Alan Moore, John Higgs and Andrew O'Neill at Brompton Cemetery, London. Presentations and performances from SAP authors in New York City and Cambridge, MA.